I was visiting V2 tobacco in Denmark last week. If I were to describe the trip in one word, it's probably AMAZING. I’ll tell you more about my visit to the factory later. I really admire the V2 tobacco brothers. They feel so very creative, imaginative and forward. It is difficult to understand how they have been able to build their businesses as quickly as they have done and how they have been able to come up with all these great snus brands in so little time. That is really admirable. The first night we had dinner at a restaurant in Silkeborg. Mark invited me to try his snus, a thunder mint portion. I politely said no thanks, because I still haven’t got used to such strong nicotine products yet, and I was determined not to get dizzy in front of them. I however frequently try Thunder and other strong snus products when I am by myself. Something I've wanted to try for quite some time is Thunder Cool Orange. The can has really appealed to me. It looks so refreshing! Northerner Boost and Thunder Cool Orange. On the road to Stockholm, I finally got a chance to try it. I sat and listened to the audiobook about Steve Jobs while I put in my first portion of Cool Orange. The fruity taste sensation was quickly released in my mouth and I yet again found myself thinking about how inventive and full of ideas the V2 brothers are. I would just love to read their minds. At this point I actually came up with a pretty good idea myself (for a private project, so not sharing here yet) so it might be that their snus rub off with their ingenuity. 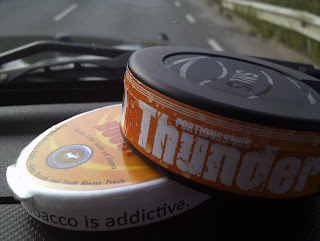 So when I have run out of ideas and need inspiration, I will continue to take a Thunder snus. 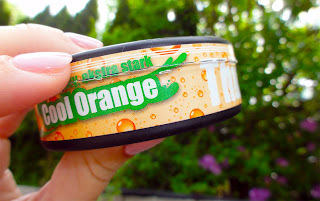 The taste of the Cool Orange portion is very fruity and has this little tingling fresh feeling that orange has. A perfect summer snus! When it comes to nicotine, it is still a bit too strong for me, so I get a little dizzy and cannot keep it in for that long yet, which is very unfortunate because the flavor seems to last much longer than that! I love the freshness of the can design. The snus can is really attractive but as fierce as all the Thunders cans are. The portions are normal sized and moist so not like my regular dry white portions. For some reason Thunder products as well as Oden’s makes it burn a little in my throat. Perhaps that is because I’m used to the purified tobacco portions. 1 comment on "Thunder Cool Orange Review"
Good review, SG. I got a bunch of Thunder Cool Orange in my shipment of various extra and ultra strong snuses (I have quite a tolerance for nicotine it seems), and I really enjoy this one when I crave a change of pace. The flavor lasts a long time, and it doesn't have the uncomfortable kick of, say, Skruf ultra, which is almost too strong even for me! Keep on snussing.